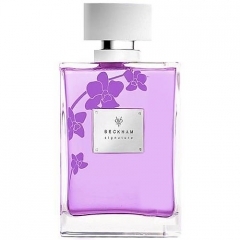 Signature Women is a perfume by David Beckham for women and was released in 2008. The scent is floral-synthetic. It was last marketed by Coty. This fragrance is surprisingly fruity, which is not something that I would have imagined Victoria Beckham putting her name to. I usually refer to fruity fragrances as being free-sprited and lively, whereas Victoria exudes elegance and sophistication. However, with that being said, the fragrance itself does not have the 'wow factor'. It's rather cheap and generic, which for the price tag is not something that you would expect. I really loved her first two fragrances for women, but this one doesn't appeal to me what-so-ever. The apple note is really strong, yet it's not as well done as perhaps DKNY Be Delicious or Ralph by Ralph Lauren. In this fragrance the apple note is sour and nauseating. I don't think that the choice to advertise this fragrance as being elegant and sophisticated was the right choice. This perfume would be better suited to a younger crowd and should be re-bottled and re-advertised to appeal to such a crowd. Write the first Review for Signature Women!